If you do a search online you’ll find all sorts of free assets like free stock images, icons, fonts and other media that work perfectly for your elearning courses. But often you find that free isn’t really free. Instead, free is free with strings attached. One of my pet peeves is people who give away free assets and then only allow them to be used for personal use. I guess there’s a big demand for free stock images and free fonts for family use. While it’s the asset creator’s prerogative to attach strings, personally I find it kind of lame. Either it’s free or not. Why work to get eyes on your product and then create that sort of friction? However, if that’s the stipulation then we need to stick by it and respect the desires of the content authors. Mostly likely those resources won’t work for your project. Another issue is that the free content comes with attribution requirements. That’s much better than free for personal use only. But it still creates some friction because the attribution requirement may conflict with your project. How to give proper credit to the creator of the assets and still maintain a professional looking course is a challenge. Here are a few ways to attribute content to the asset creator. Credits on the image. This is the easiest, but doesn’t always look good. Credits as a caption. This is also easy and easy to template. It also creates consistency, but still can be a bit distracting. The two options above are fine for school projects, but don’t look very professional. They also only allow for text descriptions and URLs. But no hyperlink to the creator’s site. Mouseover credits as the person moves the mouse over the image the credits appear. They can be over the image or as a caption box and you can link to the site. Add credits and links at the bottom of the screen. This works but may look a bit busy and not many clients want to see a bunch of outside content in their course screens. Use the player’s resource tab. Change the resource tab to read “credits” and then add links to the sites. This is really easy and looks nice. Use Engage to create an “About” player tab. Add information about the organization and course developers. An additional section could be attribution for free resources with a link back. Lightbox slides on player tabs. Create a custom slide and insert it using the lightbox feature. 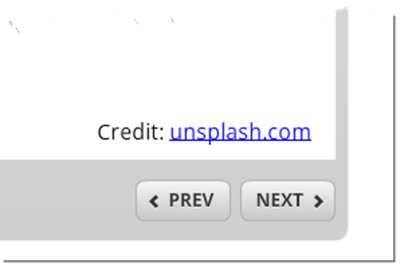 This lets you make it look any way you want and add any type of information and links back to the site. Personally I like the resource tab and lightbox options. 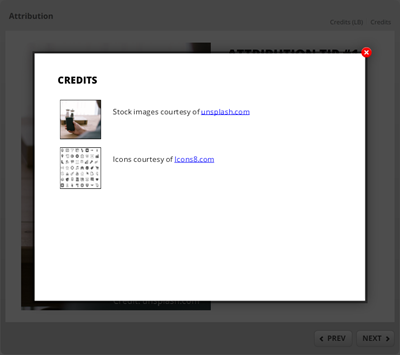 The resource tab is simple and the lightbox means I can make the credit page look anyway I want. 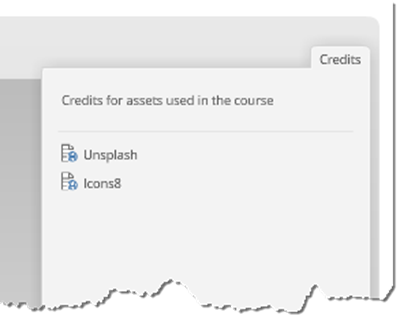 Icons8 allows this for their free content. You can find it in their licensing. And I’m sure most of the others would, too. If you’re not sure, ask the source of the free content. I’ve found that often they’re happy that people are getting use out of the free assets and appreciate that I’ve even bothered asking. Often they’ve given me permission to use their assets. It doesn’t hurt to ask. Here’s a published version of the different ways to attribute the free resources if you want to see them in action. Click here to view the attribution demo course. 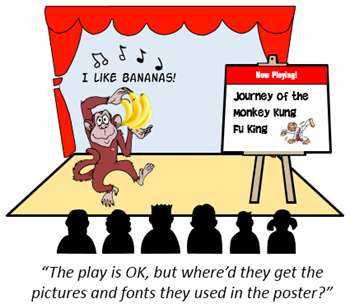 What do you do when you get free assets that require attribution? 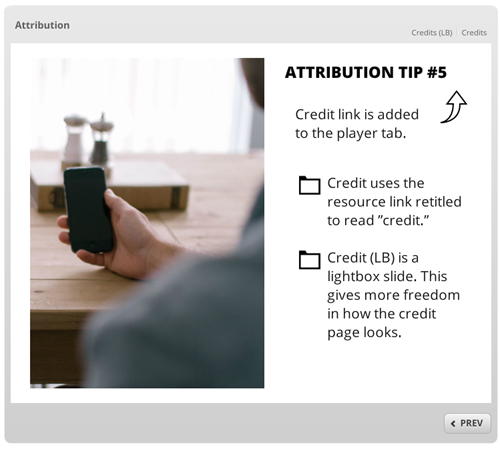 How have you attributed free content in your elearning courses? Thanks Tom! This is something I come up against all the time and now I have some new ways of providing the appropriate credits without them being imposing. I agree Tom: free should just be free, for any (lawful) use. It’s annoying to spend all that time trying to find the right image, only to find out upon reading the small print that you can’t really use it. I generally don’t use free assets that require attribution; I can usually find what I need ‘without’ strings, or sometimes I just buy it. One thing that I think is OK for the creator of the asset to do is to ask (nicely) anyone who uses their asset to let them know how they used it, and send them a link (if publicly available) or even a screenshot. This way, the creator can show/re-post on their site how their asset has been used and get some exposure, and the elearning designer does not have to attribute in the course or product itself, thus making it look nicer and more professional. This was definitely a just in time training for me. I was planning on creating a course for the challenge this week that used a lot of outside assets as inspiration and wanted to give them credit. Thanks for the article! My answer is that if you financially benefit from my photos, I want to as well. But if you just need my photos to add to your blog post or create something beautiful that you share for free, I have no need to charge you for that. I also have a narrow definition of commercial use. For example, if you posted my photos here on your blog, I would not see it as a commercial use because the blog is freely accessible to all. But if you slapped your corporate logo on my photo and sold coffee mugs with that image, I would chase you down and ask for a license fee. @Daniel: thanks for the feedback and explanation. Thank you for the great info Tom. As a professional and a grad student in training & development (Roosevelt University), I always find myself at a loss. I would never want to undermine the work of another professional, but I don’t have a budget for images. I REALLY like the lightbox idea. Did I understand you correctly that this might be something clearly stated in the licensing agreement? I am also working on a guest entry for our blog (www.rutraining.org) and will probably need to use one of your initial suggestions to credit on the image or the caption. That was something I had not really thought about before your post. I’ve been following your blog for about 2 years and I’ve learned so much. Thanks for all the great suggestions (and humor)! I agree with you about strings being attached to “free” assets. It is like giving samples at the store, but as soon as someone takes it, you tell them that you need their credit card info or they have to pay the discounted rate. @Amy: yes, some of the content owners explain in more detail how to attribute their content. It doesn’t hurt to ask them and see what’s appropriate if you’re not quite sure what to do. anyone in education recognizes the caveat: one MUST NOT borrow without attribution – this is rightly called plagiarism when the ‘borrowing’ consists of textual material, but for some (unknown?) reason, ‘borrowing’ images and sounds do not engender the same attitudes of reproach. Some of this can be ascribed to the extent to which mechanisms (software) are available to sniff out text plagiarism [SafeAssign, Turnitin, PaperRater, the New York Times, etc.]. These mechanisms are both less common as well as more complicated to implement in the image/sound realm. Thus social (and legal) reinforcement of public disapproval of ‘borrowing’ images/sound are less well-developed societally. nonetheless (and this has been articulated (;) in countless arenas), in many communities your ‘private’ property is considered to be YOURS until you specifically relinquish control over it – like when you deposit your old cellphone (or printed cellphone photo) in the GoodWill bin – until then, NO ONE may take it or use it without your permission. Just because you [forget and] leave your cellphone, under your seat, in a gymnasium full of 50,000 other folks, you don’t expect people to pick it up and use it to call Botswana or Bolivia or Belgium for 10,000 minutes (even if it doesn’t cost you anything because Verizon stops the charges). Some may excuse this example as non sequitur, but the phone and the image are identical in that each cost someone (privately) something to obtain it, either by working, and buying the phone/image, or manufacturing the phone by hand from parts/drawing the image. Just like my neighbor allows my other neighbor to borrow his lawn-mower – the neighbor(borrower) may use it occasionally, but my neighbor(owner) asks that he (borrower) not (sell the) use (of) the lawn-mower to mow the lawn of another neighbor, for pay. Likewise, you might occasionally allow other people to borrow your cellphone (probably in your presence) to make a ‘local’ call, but you might balk at letting them call Botswana (for more than a couple of minutes (;) or to take it home with them – to be returned sometime later! There is a real cost to the use of the mower-gas,wear and tear/phone-minutes,battery. Depending on exactly what the digital asset is, the use of it – even though an exact digital copy of it can be duplicated for $.0001 – may make it worth less, even worthless! If, for instance, an image is used in numerous productions/ads/etc. on the web, it will loose its ‘uniqueness’ – that is one attribute that cannot be duplicated. In the digital world, the ‘borrowing’ of digital assets without payment (even AS LITTLE PAYMENT as: “graciously provided by freeeImages.com”) can be a ‘consequential economic loss’ to the creator if otherwise the creator might charge for it. That the ‘borrowing’ is EASY, makes no difference. Surely the creator must be granted the right to ‘charge’ at least, “with thanks to . . .” without enduring the web community’s scorn. The attribution provides, minimally, a tiny bit of ‘pay'(advertising) to the creator. After all, you have spent your precious time to find and CHOOSE this particular “digital asset” because it is HIGHLY USEFUL to you, right? Celebrate that fact by figuring out a way to thank the creator. To be sure, i am not making a legal point – merely(!) an ethical one. Anyone familiar with the ‘tragedy of the commons’ will recognize an array of implications. One obvious, and ongoing, behavioral response to rampant ‘borrowing’ is that the finest examples of, the best resolution and tone, the greatest depth of color and finish, the most exquisite representations of digital objects will not be exhibited to us – at all. We won’t even know they exist!